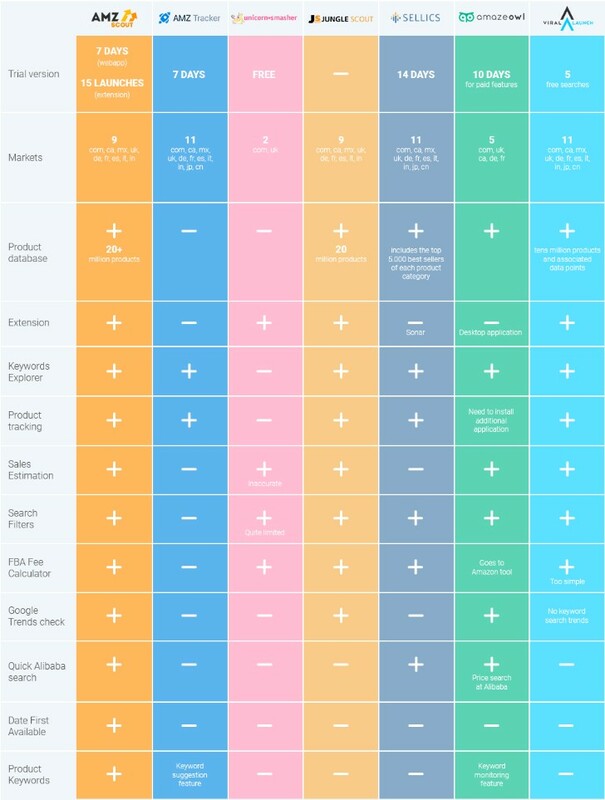 We have decided to compare our tool with other Amazon selling tools to see how well we fare. As it turns out, extremely well. Are you choosing the right tool that will help you run a successful Amazon business? Most likely you have already tried some tools. We think it’s fair to assume that you would like to know if the one you have is the best you can get. Does it have a broad set of data? Is the data set accurate? Are there any special features? Are they useful? AMZScout provides a very broad data set. AMZScout provides some important indicators that many other tools don’t have including: date first available, inventory, net margin, RPR, min price, number of item’s variations, favorites, and even bestseller tag with the category where it sells the best. These indicators help you follow competitors and find hidden niches more effectively. All within a well organized user friendly interface. AMZScout has a built-in Amazon FBA revenue calculator. AMZScout has everything you need to conduct your research in order to find a profitable product. Once you have some product ideas, it is only natural that you would want to analyze them in detail. At this point you might ask yourself: Can I calculate Amazon seller fees? How much profit can I expect? That’s where AMZScout profit calculator comes into use! AMZScout shows detailed LQS and keyword ideas. AMZScout gives the detailed LQS for all products on Amazon. There is also a button that generates keyword ideas for each product that you can use to optimize your PPC. Due to improved and refined algorithms, AMZScout has the best data accuracy. We work hard on the accuracy of sales estimation. Our calculation is based on the Amazon selling rank as well as the best sellers rank (BSR). Every day we track Amazon sales of more than 200,000 products in different categories. We keep improving and expanding the database to boost the accuracy of our estimates. We group Amazon sales data by categories, then estimate sales for each product using comprehensive algorithms. Please keep in mind the number of sales you see is just an estimation. It might be slightly different from the real sales figures. Moreover the market is very dynamic and situation may change drastically any time. AMZScout has impeded Alibaba search that helps you find Chinese suppliers quickly. Whether you need to just check a purchase price or find a real supplier in China, this option is very convenient. You won’t need to open another tab, to open Alibaba website and search for a similar product. Just click one button and enjoy the results in a new tab. AMZScout does not require Amazon or a Seller Central account. You don’t need to provide your Amazon seller login to get data such as FBA fees, net price, weight, and size. So, you can save money by putting off buying an Amazon account before you are ready. Seller Central details are also not required to use any of the AMZScout tools! AMZScout is available in 7 languages. The tools are translated into 7 languages, including Chinese (English, German, French, Russian, Chinese, Japanese, Vietnamese). AMZScout has trial with full functionality. We have a fully functional trial available, so you will know exactly how AMZScout will be after you buy it. Try it right now! It’s absolutely free!